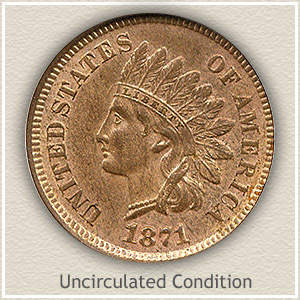 1871 Indian head penny value can easily climb above $73 if your coin is in nicer condition than what is normally found. Condition and how well defined are the remaining details is key to value of these old pennies. Most available today are in rough shape. On all but a few, extensive use has worn the majority of the design smooth, and today’s collectors seek coins with the least amount of wear. As you examine your coin, if a headband is showing above her eye with maybe a letter or two of "Liberty" visible inside, it has added collector appeal and value. Rarely does an old penny survive with any amount of detail remaining. Fewer still are available to collectors with minimal to no wear. An 1871 penny was never abundant, the original mintage was relatively low. However occasionally a well preserved example turns up that never became worn. These "uncirculated" coins are at the top in value, $385 and up. Below the value chart are images and descriptions to help judge the condition of your potentially valuable 1871 penny. A visual treat is occasionally brought to market. Glowing orange and bright golden yellow are just two of the hues shining from the surfaces. 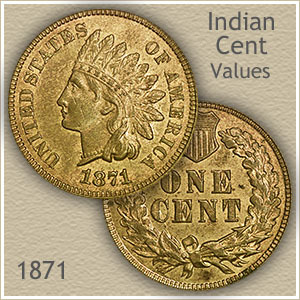 Eye appeal and strong 1871 Indian head penny value is evident to all. 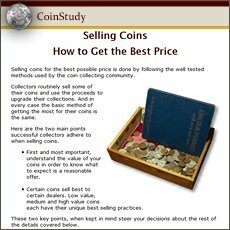 Beginner to advanced collectors readily see the gem quality and expect a high price when such coins are offered for sale. Rare coin auctions are usually the venue for these outstanding coins, they attract seasoned dealers and advanced collectors. Needed to complete high end sets of Indian pennies, the stunning 1871 Indian head penny pictured was bid to $2199 at a David Lawrence auction. Looking at your coins, set aside visually standout examples. Your judgment of attractive coins is universal and recognized by collectors as well. An 1871 penny or any coin with clearly visible design details is one to expect as having strong demand coupled with strong value. It needs stressing the importance of your coin’s condition and its relationship with value. Widely collected and closely studied, tens to even hundreds of dollars in value often depends on the smallest of details remaining or missing. To get an idea of how desirable to collectors and some of the prices paid for top condition 1871 pennies, one appearing at auction is highlighted below. Uncirculated: Desirable because no wear disturbs the surface. This penny despite its age is in like new condition and rising to the high end of 1871 Indian head penny value. Toning may appear as a dark redness and brown, however no parts of the design have been worn from contact. With a magnifying glass examine her cheek and the tips of the feathers for wear. Minting imparts a certain grain to the surfaces of coins, wear can appear as a somewhat glossy or smooth area and sometimes with dullness to the area. 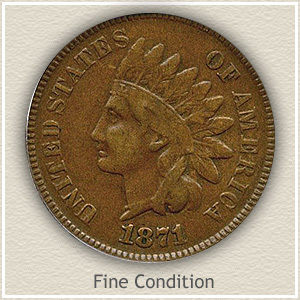 Extremely Fine: An 1871 Indian penny in "extremely fine" condition is well defined in all areas of the design. Boldly rounded and separated are the hair curls and headdress ribbon below her ear. The headband remains very detailed with every letter in "Liberty" complete and sharply defined. Overall a nice coin with some light wear that does not detract from its appearance. Fine: Wear has merged the hairline and headband and continues down the neckline smoothing the ribbon and hair curl where they meet. A positive is the major details of the feathers show and each feather is separated from the next. Clearly a coin that has seen moderate wear but still has some sharpness. Good: Worn to a shallow relief with little detail remaining describes a coin in "good" condition. The area surrounding the eye is slightly defined. Just visible is a separation of chin and neck. The headdress and feathers are worn smooth showing just an outline. Although the lettering and date are heavily worn they should be separated from the rim. 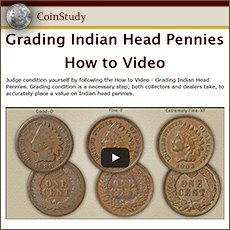 Your 1871 Indian head penny value may be at the low end of the scale but because of its history they remain an important coin. $1 to 2 dollars for common dates. 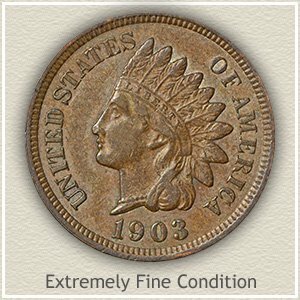 With many advanced collectors pursuing Indian pennies the rare dates along with your 1871 Indian head penny value are moving higher. As always better condition coins are especially sought. Today your box of old coins has never been more valuable. Follow the steps above and increase your ability to realize higher value if selling and finding coin buyers.